The objective of Counter-Cameroon dice game is to score maximum points by winning categories numbered from 2 through 12. The game is played with 4 six-sided dice and categories belong to all possible numeric combinations of two dice together. 4 dice and a score sheet (see below). The two players take alternate turns to roll 4 dice and then split it to into two pairs. 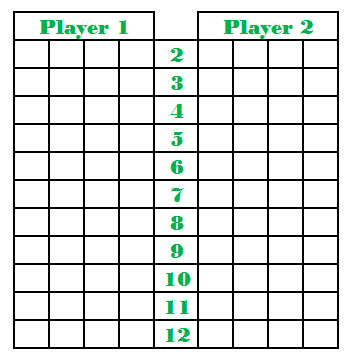 They then mark total of each pair in the score sheet which contains 12 rows marked from 2 to 12 each value corresponding to two dice combination. Each row has 4 boxes for each player. When a player marks all 4 boxes for a combination that combination is won by the player. Players can not mark a combination after it has been won. 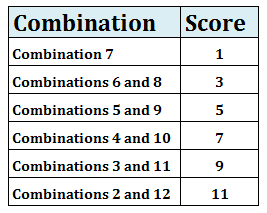 Once all combinations are won by either players, a total is done for both players by counting the combinations won by them individually and adding points for each combination as per the points table below. The player scoring more points wins.